You can now follow "Sons of Alpha Centauri" via the dedicated YouTube channel. New videos have been uploaded ready to watch plus you can watch all videos from the usual video page. 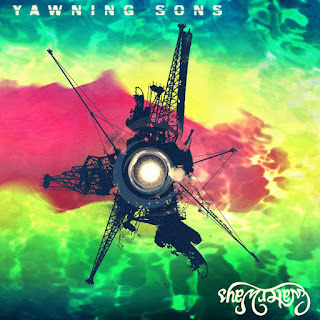 "Yawning Sons" are proud to announce the release of their split record with the new surf rock project from desert forefathers 'Gary Arce', 'Mario Lalli' and 'Tony Tornay' called "WaterWays". The record will be presented on limited edition heavyweight aqua blue 7" vinyl featuring new material from both acts. The record will be released worldwide on Christmas Eve 2010 and will be available with a thick card gloss poster as a limited package in the Shop. "Sons of Alpha Centauri" would like to thank everyone who attended the "A Storm of Light" show in October and are currently in pre-production for the recording of the follow up to their debut album "Sons of Alpha Centauri". The "Sons of Alpha Centauri" split 7" vinyl release with fellow instrumentalists "Karma to Burn" is now available through the Shop. This deluxe presentation on transparent vinyl features an exclusive new SOAC track and Karma to Burn track "14" remastered exclusively by SOAC. If you would like to subscribe or have any comments for the band then please email SOAC through the contacts section. Feedback is encouraged. Trippin' on the fourth of July! Contact SOAC to arrange Shows, PR, Licensing or other via the contact page. Copyright © 2019, Sons of Alpha Centauri.